Clinton Lauds Virtues Of Al Jazeera: 'It's Real News' : The Two-Way Secretary of State Hillary Clinton went out of her way Thursday to single out the Al-Jazeera TV news network for its work in covering recent uprisings throughout the Middle East. 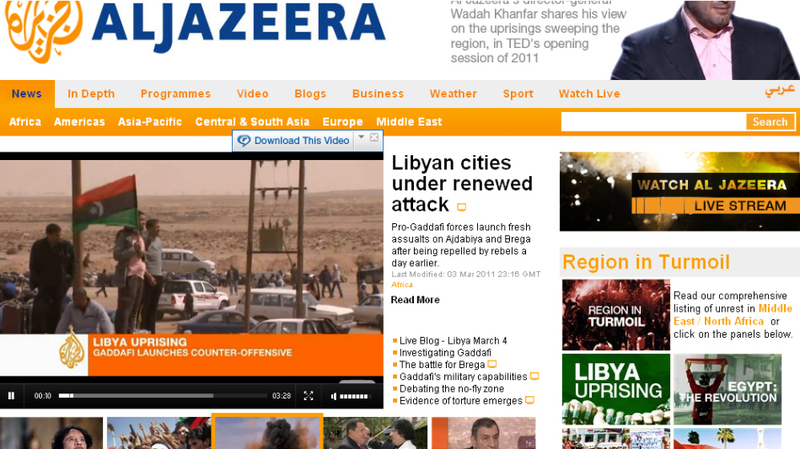 A screenshot shows the Al Jazeera English website. The network has been providing around the clock coverage of unrest in the Middle East. Secretary of State Hillary Clinton went out of her way Thursday to single out the Al Jazeera TV news network for its work in covering recent uprisings throughout the Middle East. "You've got a global — a set of global networks — that Al Jazeera has been the leader in, that are literally changing people's minds and attitudes," Clinton told members of the U.S. Senate Foreign Relations Committee. Her remarks are a marked shift from the hostility expressed toward Al Jazeera by many conservatives, as well as some officials under former President Bush. "Viewership of Al Jazeera is going up in the United States because it's real news," Clinton said Thursday. "You may not agree with it, but you feel like you're getting real news around the clock instead of a million commercials and, you know, arguments between talking heads, and the kind of stuff that we do on our news," Clinton said. "Which, you know, is not particularly informative to us, let alone foreigners." The network's new success was also covered in a profile by NPR's Deborah Amos Tuesday.